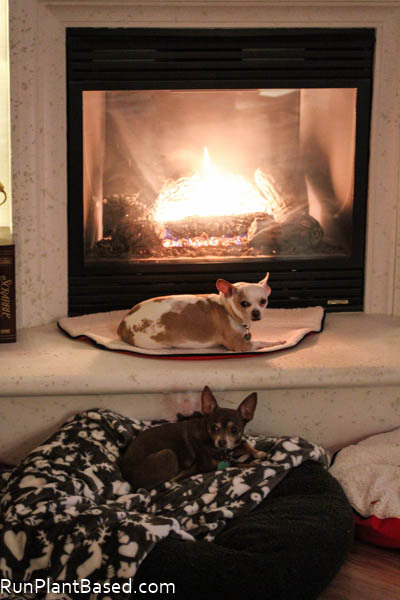 The chihuahuas have a serious case of the lazies this week and are sticking to their cozy fireplace beds. At most they shift to a different blanket or bed. 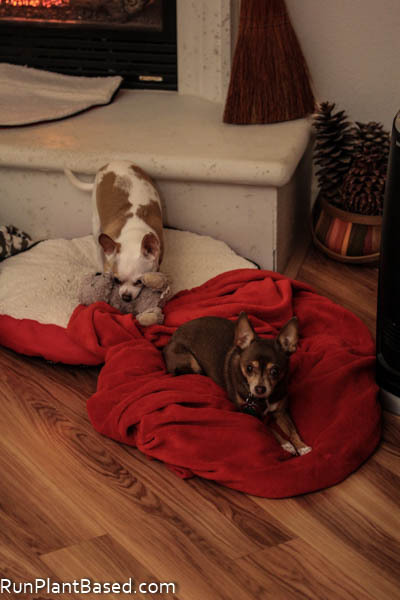 And occasionally fight over who gets to claim the fuzzy red blanket. Rough life and I’m actually very jealous with such a busy week at work. But it’s fair since they can’t enjoy the large stash of avocados I acquired after a Grocery Outlet shopping trip. It was $2.99 for like 7 avocados, I wasn’t thinking about if I’d use them in time! Thankfully the fridge is preserving them nicely and I get to create a lot of simple avocado dressings this week. This dressing is simple with a simple list of ingredients. But it has a bright and tangy flavor with a silky, yogurt texture. 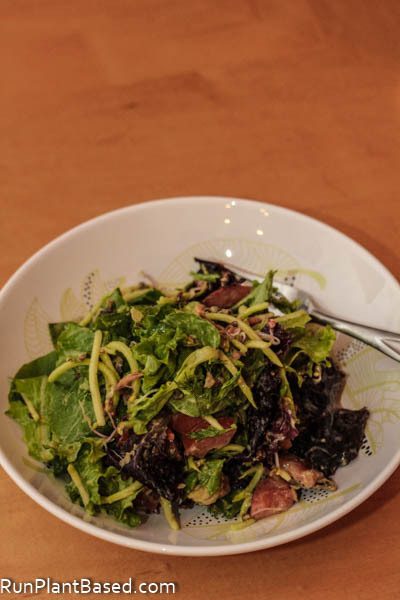 I coated an interesting salad of organic mixed greens, carrot broccoli slaw, tempeh, and radish sprouts for a hearty meal salad. Loaded with interesting colors and textures. The dressing is rich, tangy, and with just the right amount of Dijon flare without being biting. An overabundance of avocados sounds like a very good problem to have! Mmm, I can never get enough, and I would slather every meal in this gorgeous green dressing if I had half a chance. So true, I couldn’t resist grabbing them at that price. Thanks! That dressing recipe is so healthy, creamy and delicious. The right dressing really makes the salad! I’m pinning this! 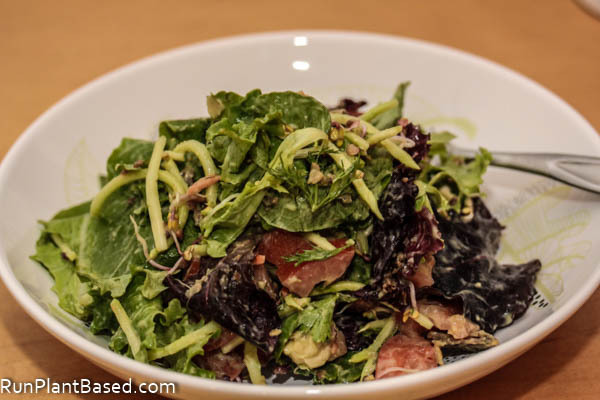 Thanks and agreed, I love making simple and healthy dressing to bring a salad to life! Haha! 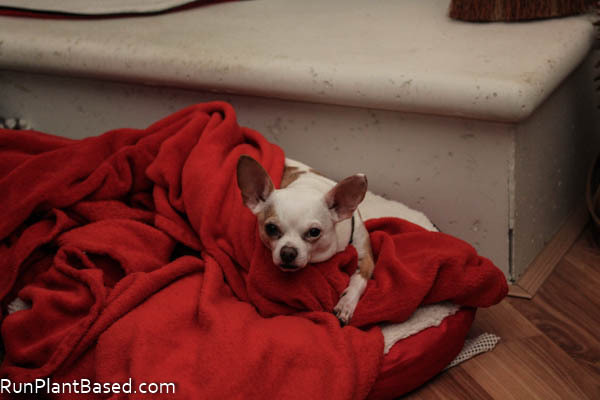 My chihuahuas are having the same kind of week, only they are not enjoying it much. They are so desperate to get out, but it’s so cold that even with a sweater and a coat they start shivering and lifting their paws within a block of home. Poor babies. 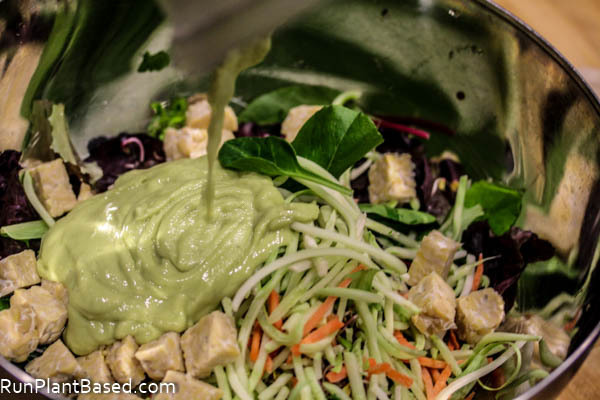 This avocado dressing looks divine. I don’t think there’s a better food than the avocado. Ugh, I can only imagine how miserable mine would be with snow, Miko shivers with a cool breeze!